Don’t be fooled by the 25 October 2011 release date in the iTunes Store and the Lancia Media Factory label, Scrapomatic is, as far as Hughesy can make out, a repackaging on the Minnesota duo’s first album, released around ten years ago and resequenced here. Formed in Minneapolis after Harvard graduate with a degree in American literature Mike Mattison met University of Minnesota music composition student Paul Olsen at a P-Funk concert in 1994, Scrapomatic started relocated to New York, where, you’d imagine, there’d be a bit more work for a quality voice and guitar duo. 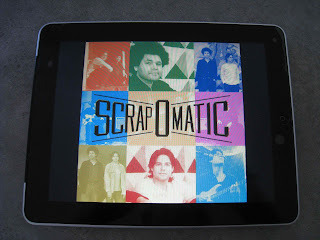 Given the fact Scrapomatic were working the same New York singer-songwriter circuit as Nora Jones they must have impressed somebody, since the debut album was recorded in Louisiana with an impressive collection of studio players. They mightn’t be household names, but drummer Johnny Vidacovich’s credits include Bobby McFerrin, Stanton Moore, Willy DeVille, Johnny Adams, Professor Longhair, James Booker and Mose Allison. On bass, Bob Sunda is a thirty-year veteran who’s backed Mose Allison, Charlie Byrd, Elvin Bishop, Gatemouth Brown, and Junior Wells and while keyboard player Larry Sieberth may have relocated from New Orleans to New York he picked up seven gigs at the 2012 Jazzfest. With material by Scrapomatic (there’s a cover of Mississippi John Hurt's Let the Mermaids Flirt With Me), arrangements by Larry Sieberth and a studio outfit with substantial chops the result is a tasty dozen tracks that sound comfortably in the soft soul, blues derived end of the spectrum with some tasteful New Orleans elements thrown into the mix. A careful listen, however, reveals things aren’t quite as straightforward as they appear on the surface. There’s a lyrical slant that probably comes from Mattison’s background in literature. Mattison can definitely write, as evidenced by Midnight in Harlem on the Tedeschi Trucks Band’s Revelator, though these efforts come from considerably earlier in his career, and he could probably sing the phone book with a reasonable degree of soul. Nothing hereabouts goes anywhere near over the top sonically, which when you think about it is hardly surprising given the vocalist plus a dude on guitar modus operandi on live gigs around this time, but if you’re inclined towards well-crafted tuneful music with a bit of lyrical depth, Scrapomatic is well worth sampling.